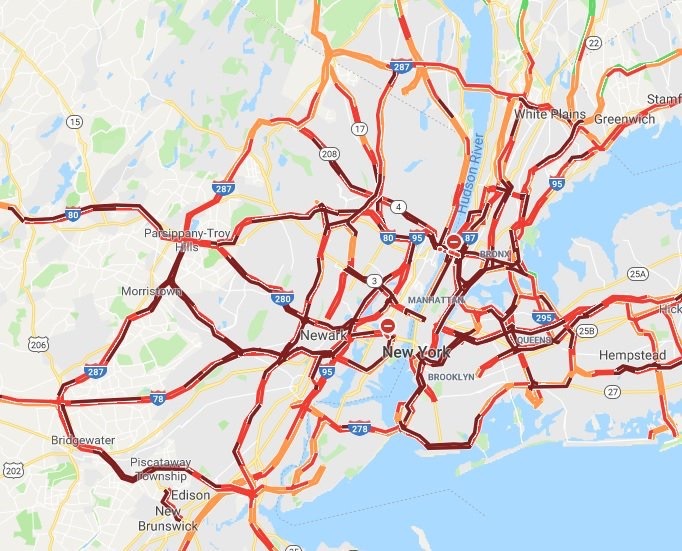 New York - The snow and ice that literally brought the greater New York area to its knees yesterday may be no match for the heated anger that appears to be everywhere today as area residents demand explanations for the abysmal failures that left commuters stranded for hours on end. Somehow, everything went horribly wrong yesterday just about everywhere. Forecasters began issuing warnings during the day that snowfall totals could be somewhat higher than expected and within hours the situation deteriorated rapidly and stories of people who spent hours stuck in their cars at a dead standstill piled up faster than abandoned vehicles on the side of the roadways, with many just choosing to walk to safety instead of trying to navigate roadways that were simply impassable. Both the George Washington and the Bayonne Bridges were closed last night, as previously reported on VIN News (http://bit.ly/2ThKQah) and reports of commuter busses, city busses and school busses filled with children getting stuck in the snow seemed to be everywhere. With frustration spilling over past the boiling point last night, the finger pointing began, with angry drivers taking to social media, demanding answers. City Council Speaker Corey Johnson described the DSNY’s response to the weather as “unacceptable” on social media, saying he had seen downed trees at numerous events he had gone to. Stringer was back on Twitter this morning. One angry comment on Facebook called for Mayor Bill de Blasio to resign over yesterday’s failures, reported NBC News (http://bit.ly/2Tj4z9G). Even roadways in Monsey which are typically well served during bad weather were abysmal, with desperate calls on social media going out for people to come to two local weddings that were sparsely attended and for volunteers with four wheel drive vehicles to come to the Tomchei Shabbos to pack up boxes of food and deliver them to 465 families who depend on the organization to feed their families. Hoping to finally clean up the mess this morning, the New York State Department of Transportation took to Twitter this morning, reminding residents that when heavy traffic occurs, snow plows and cars both come to a standstill. Have a stern word with them. That'll really help us. Thanks, garbagemen. I thought your job was to keep the streets clear, not commiserate over their closure. I was in Manhattan yesterday and left at 2:15 from w. 57 st, between 6 and 7 ave. It took an hour and a half to get through the Lincoln Tunnel. Then 45 minutes to get gas at the Alexander Hamilton rest area. The FOUR MORE hours to get to Lakewood. Total travel time, SIX hours! Chill, call the office and say you are not coming in. Take the kids out for a walk in the snow. They will remember the time you spend with the all their lives. Why is it when the weathermen say they know what will happen to our planet 20 years from now we are told we must believe them. End of Debate! Yet these same weather predictors cannot figure out that a major storm is happening a few minutes into the future? Brilliant, except these people have to get home first.